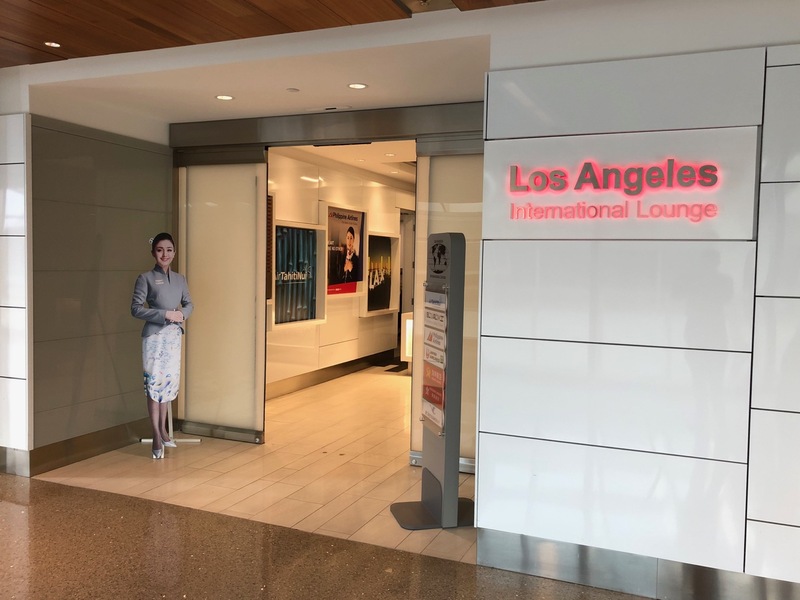 The Los Angeles International Lounge in the Tom Bradly International Terminal at LAX is the “leftover” lounge. Emirates and Etihad have their own lounge at LAX. Oneworld and Star Alliance both have first class and business class lounges. SkyTeam uses the Korean Air lounge. Then there’s carrier like Philippines Airlines, EL-AL, and Hong Kong Airlines that are not affiliated with any alliance. That’s where the Los Angeles International Lounge comes into play. The lounge has other food as well: mostly packaged, but some sushi, cereal, fruit, oatmeal, instant soup, muffins and croissants as well (I was there at 9:00AM). Self-service alcohol is also available. Seating encompasses both indoor and outdoor areas. The lounge never got too crowded, though it never emptied out (I was only there for an hour). The balcony overlooks the beautiful Villaraigosa Pavilion below. If you have access to this lounge, it will be open before your flight: you don’t need to worry about opening hours unless you like to arrive at the airport several hours early. The lounge opens daily at 6:00AM and closes after the last flight departs. Restrooms were clean, but there are no showers. Use the airport’s wi-fi network instead of the lounge wi-fi, which is slow. It helped to go in with low expectations, but this lounge wasn’t bad at all. Sometimes it is nice to have packaged junk food and I appreciated a decent cup of coffee and some salted mixed nuts. As great as it is to spend time in great lounges like UA’s Polaris and the Qantas lounges, sometimes having access to a quiet clean space with drinks, snacks, and a place to sit is luxury enough. We jaded frequent travelers sometimes lose sight of that. I cannot agree more. For all the talk of AS limiting Priority Pass access, and Centurion lounge overcrowding, last time I was at SEA, I decided to visit The Club. Panned by bloggers as worthless, I found an oasis of packaged snacks, sugary beverages, hot instant noodles, unused restrooms and immense privacy. Interesting that there’s a ONEWORLD lounge and a Star Alliance lounge while poor skyteam lacks a lounge. But DL has one as well as AA, UA, QF, AS, & AC as well as KE, EY, & EK. JL used to have an LAX lounge for Premium Economy passengers but that lounge is now gone. while Business/First Class use the ONEWORLD LOUNGE. With rather limited PriorityPass lounge (vs. restaurant) representation in the Bradley LAX terminal when occasionally using any of the non-Alliance carriers, it’s surprising (if not a shame) that PriorityPass hasn’t made a deal to include this facility. But thanks for the little photo of those delicious Milano packs (yum! ), as the “Clubs” (SJC, MCO, ATL, etc.) at least seem to have discontinued them recently. Hello i came searching on google.. And this came uo.. Good review of one of the many lounges world wide. I am going to USA on holidays… but on my return back to LAX airport i must catch the Qantas back to Australia. I will have a economy ticket. I am no member or anything to lounges. So is this the only lounge that i be able to get in for 2 passangers who are traveling back to australia on economy ticket ? My terminal shown on my booking that Qantas will be on Terminal B. There for i prefer to remain at Terminal B once after check in thru security and all that passport stamp. As i dont want to muck around diferent terminals across LAX airport as ive never been to USA nor LAX International airport. My qantas flight dosnt depart until about 1120pm at night. So i like to arrive at LAX airport once the holidays are over in LA… that i like to be at the airprot for aprox 4 or 5 hours to make sure i never miss my flight and all that busy lines to get in and such. So is there a Lounge i could get in without been a member ? Of course i will have to pay but how do i pay online (if it has an official website) ? Which lounge will i be able to go to… I wouldn’t no. It seems that Qantas lounge on Terminal B are for members… so not sure.. But i do preferred to remain in the same terminal B for my departure flight by Qantas. Ive ask people around and people think there is no private lounges at lax and some just don’t no nothing about it. Well i do like to relax away from crowded people i be departing on a saturday time at night. As i like to charged my phone and relax and eat at the lounge and perhaps private shower so i can refresh myself up ? Let me know as i need help assistants with lounges at Terminal B at LAX for the departure flight. Hi Miguel, there is no paid option available in Terminal B. I recommend you find a nice restaurant instead. The Korean Air lounge, which is a Priority Pass lounge, is closed to Priority Pass cardholders in the evening.